Aging is an inevitable process of life, yet there are numerous ancient Indian holistic practices to assist us in aging healthily, to retain our youthfulness and prevent dis-ease. 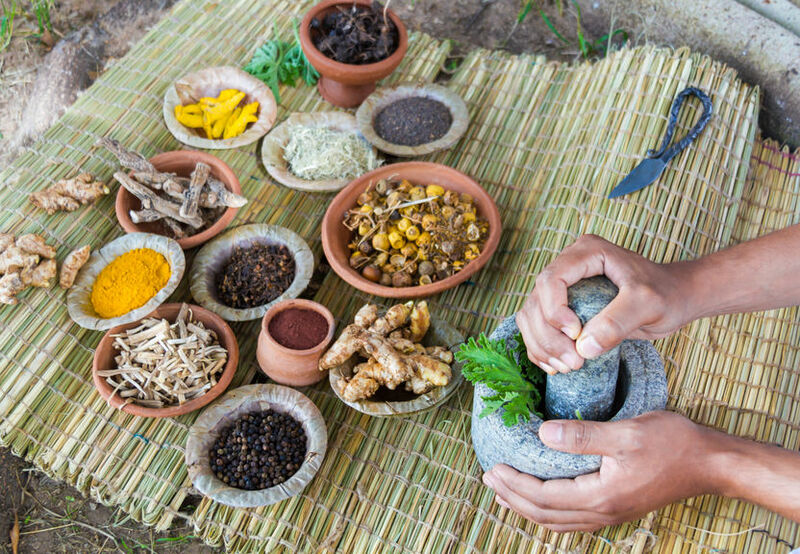 The traditional healers of India had a wealth of knowledge on how to delay aging naturally — centered on the body and mind to instill well-being on a physical, mental and emotional level. Throughout the generations much of this has been kept alive, some of which is described below. There are many ways to delay aging naturally which includes an emphasis on a whole foods diet, acupressure therapy, barefoot walking and natural skin remedies. Combine these practices into your daily routine and you will be well on your way to youthful vitality throughout your life. What we eat directly affects our aging process. A whole food diet consists of whole, unrefined, unprocessed plant-based food and is a great way to delay aging naturally. Nature’s food absorbs an abundance of solar energy from the sun, which makes it positively and negatively balanced, to nourish every cell within our body. A diet of whole food encourages healthy digestion and assimilation as the body recognizes food in its natural state. Unhealthy cravings are reduced as the body receives all of the nutrients it requires, in an unadulterated form. Gooseberries contain the highest source of vitamin C, rejuvenate the bodily systems, fight free radicals, reduce facial lines and stimulate new hair growth. Turmeric contains anti-inflammatory, anti-oxidant and anti-microbial properties to reduce inflammation and purify the blood, to slow down the aging process. Ginger is an anti-aging tonic, reduces inflammation to improve cardiovascular and respiratory health which encourages healthy oxygenation. Sprouted nuts, seeds, lentils and beans are a powerhouse of nutrition, highly alkaline and detoxifying to assist with the regeneration of skin cells. Ghee is clarified butter, rich in anti-oxidants and anti-aging properties, which is used extensively in India to nourish and detoxify the body. The ancient Indian holistic practice of treating dis-ease by applying intermittent pressure on specific areas of the body which correspond to specific parts of the body, to regulate the vital energy and encourage good health. The traditional healers of India believed that the body’s life energy was discharged from the right hand, from the age of thirty five, which initiated the aging process. The youth maintenance acupressure point, located midway between the wrist and elbow, on the inner right arm, was believed to preserve life energy and actually reverse the aging process to a degree. Intermittently press this point for two minutes, three times a day to regain vitality and youthfulness. Facial acupressure is the holistic practice of balancing the energy flows throughout the body by applying gentle pressure to specific points on the face that correspond to the body’s organs, glands and systems. Regular self-treatment improves facial circulation, oxygenation and increased lymphatic drainage, to improve skin health and texture. To apply facial acupressure treatment, gently massage the entire face, in small circular motions, using the middle finger. Massage in an anti-clockwise direction for two minutes and then in a clockwise direction for two minutes. End the treatment around the jaw line, where the lymphatic points are located. Apply two times a day. To reduce the effects of stress within the body, which can contribute to the aging process, firmly massage the middle toes for two minutes, two times a day. The stress acupressure points are located at the base of the middle toes. The degree of pain on any acupressure point directly relates to the severity of the imbalance. Continue until any pain has been alleviated. The ancient Indian holistic practice of walking on the natural earth, barefoot. Within the earth there lies a powerful and unique energy source which we can draw upon. The earth is composed of minerals and the body is mineral in essence, therefore the body’s energies resonate perfectly with the energy of the earth. The earth’s energy is greater than that of the body, and this enables it to be absorbed naturally through the soles of the feet. Practice walking barefoot on the bare earth, grass or sand for ten minutes in the evening, to discharge the accumulation of harmful free radicals and electromagnetic pollution, to absorb a concentrated source of anti-oxidants, to balance the body’s natural energy rhythms and to rejuvenate the bodily systems. Traditionally, pantry ingredients were widely used to beautify the skin and treat skin problems. Today, as we become more aware of the harmful chemicals in beauty preparations, we are naturally being drawn to pure cosmetic ingredients, to assist us in keeping our skin youthful and glowing. To reduce the appearance of wrinkles, apply a face mask of avocado and banana. Mash together half of a ripe avocado with half of a banana. Leave for fifteen minutes. Rinse with cool water. To reduce the appearance of puffiness, apply a face mask of basil and cucumber. Mix one teaspoon of basil powder with two teaspoons of finely grated cucumber. Leave for fifteen minutes. Rinse with cool water. To encourage healthy glowing skin, apply a face mask of apple and raw honey. Mix one finely grated apple with two teaspoons of raw honey. Leave for fifteen minutes. Rinse with cool water. To relieve dry skin conditions, gently warm two teaspoons of organic ghee. Apply to the face using small circular motions. Leave for fifteen minutes. Remove with a warm flannel. To relieve scaly skin conditions, apply a face mask of papaya and banana. Mash together two tablespoons of papaya with half of a banana. Leave for fifteen minutes. Remove with a warm flannel. To relieve inflamed skin conditions, apply a face mask of ground almonds and neem oil. Mix one tablespoon of ground almonds with two drops of neem oil and a little warm water. Leave for fifteen minutes. Rinse with cool water. To relieve sensitive skin conditions, apply a face mask of sandalwood powder. Mix two teaspoons of sandalwood powder with two teaspoons of warm water. Leave until dry. Rinse with cool water. To relieve oily skin conditions, apply a face mask of chickpea flour and lemon juice. Mix two teaspoons of chickpea flour with one teaspoon of lemon juice and a little water. Leave for fifteen minutes. Rinse with warm water. For all age-related skin ailments, include freshly pressed raw green vegetable juice, organic ghee and sprouted nuts, seeds, lentils and beans, in the diet. In today’s busy world, as the temptation to undergo the latest quick-fix cosmetic procedure becomes increasingly accessible, we can benefit enormously from ancient Indian wisdom of self-healing practices to instill inner balance and harmony. Intuitively, we desire to care for our body holistically and the above tips are a great way to delay aging naturally while reflecting outer radiance and youthfulness.